After attempting to steal back a necklace that belonged to his deceased mother, Samuel Collier is sent to an orphanage run by Reverend Hunt. The 11-year-old joins him on a journey to the New World, serving as a page to Captain John Smith. 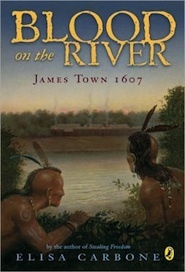 Samuel’s account of the voyage to Virginia, political intrigues among the settlers, and the harrowing first winter of the James Town settlement brings to life figures like Smith, Powhatan, and Pocahontas.